Brenda graduated from Fresno State in 1976, gained great initial experience for her first years as a therapist at Fresno Community Hospital doing rehabilitation of strokes, orthopedic surgeries and spinal cord injuries. She then focused her training and experience in out-patient orthopedics. 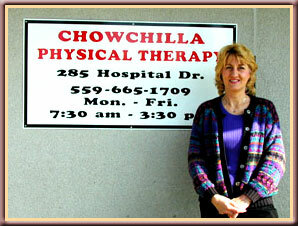 She gained certification in manual therapy in 1986 from the Institute of Graduate Health Sciences. She continued her learning and has completed certifications in soft tissue mobilization, TMJ treatment, cranio-sacral therapy, positional vertigo, incontinence training, relaxation training, Bowen Therapy, TBM and BodyTalk. She is currently studying with NAIOMT, taking their series of orthopedic manual therapy courses and tests. She lives in Fresno and enjoys gardening, skiing, rollerblading and helping her two sons with their very active lives. Brianne graduated from Therapeutic Learning Center of Fresno CA in 2004. She has since been practicing as a massage therapist while also working as a Physical Therapy Aide and Chiropractor's Assistant. She gained much experience as a PT Aide in a large pt clinic in Merced and is returning to school to become a PT Assistant. She specializes in Swedish, deep tissue, pregnancy and hot stone massage therapy. In her free time, Brianne enjoys reading, traveling and spending time with family and her dog Lefty.